At the iMID 2017 conference in Korea, AP Systems announced that it realized high density OLED evaporation using new FMM technologies. By adopting ultra-short pulse laser (USPL), AP Systems achieved a 1,000 PPI. Changing the pin-hole shapes, the company says this technology can even reach 1,170 PPI. 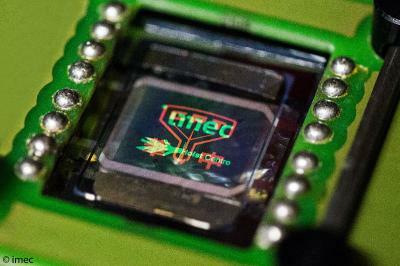 High PPI OLEDs are especially important for VR applications, which require much higher pixel densities as the display is used very close to the eye. In May 2016 Samsung demonstrated a 5.5" 3840x2160 - which reaches 806 PPI, and according to reports Samsung were able to produce a 1,200 PPI AMOLED in March 2017. Analysts from IHS say that as AMOLED displays continue to replace LCD displays and the AMOLED market is growing quickly - the market for fine metal mask (FMM) components will also experience fast growth in coming years. IHS sees the FMM market in 2017 generate $234 in revenues. 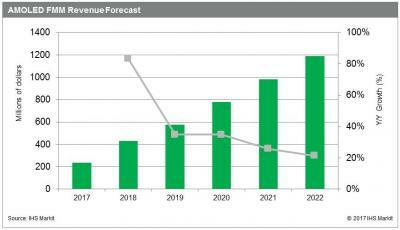 The market will grow at a compound annual growth rate (CAGR) of 38% until 2022 - to reach $1.2 billion. IHS says that FMM production is a challenge and FMM technology has become a bottleneck as display resolution is increasing and the number of FMM suppliers is limited. The leading producer is Dai Nippon Printing, and the company's FMM masks are using to produce the majority of AMOLED displays. According to ET News, Japan's Dai Nippon Printing (DNP) has terminated Samsung's exclusivity for the company's fine metal masks (FMM) products. DNP is now offering its masks to other OLED makers, and have already signed up BOE Display as a customer. DNP has advanced its FMM technology, and is now able to produce masks with high resolution - enough to create QHD (2560x1440) smartphone displays. BOE's current masks only enable it to produce FHD OLEDs, and it will now upgrade its production to higher-end displays using DNP's masks. 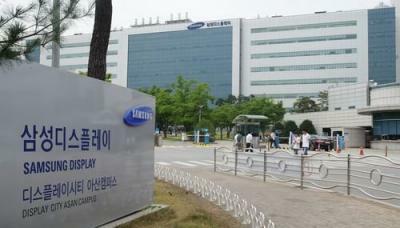 According to reports from Korea, Samsung has started construction of a new flexible OLED fab, which will be called the A4 line. This will be Samsung's first Gen-7 line as the company is aiming to expand its technology gap over its upcoming OLED competitors who are all building Gen-6 line. A Gen-7 line substrate is 1870x2200 mm in size - as opposed to 1500x1800 mm for Gen-6. This means that you can produce more displays per substrate and price per screen is lower. 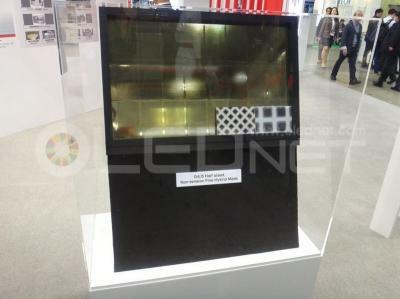 Scaling up evaporation OLED production is not so easy, but it seems that Samsung managed to solve its technologies hurdles - mainly the FMM metal masks and the LTPS annealing process. 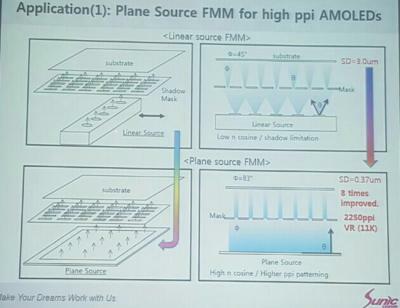 Sunic System recently unveiled a new evaporation-FMM based AMOLED system that enables high resolution deposition - Sunic says it will enable PPI up to 2,250 PPI. Sunic's new technology makes use of a plane source for evaporating OLED materials, as opposed to the currently-used linear source. Such high resolution displays will be very useful for VR applications. Sunic System now announced that it succeeded in implementing 1.1um shadow distance by using the new plane source evaporation and 100um shadow mask. Such a small shadow distance can achieve 1,000 to 1,500 PPI resolutions. 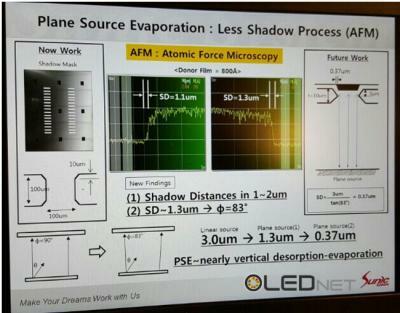 The company's next step is to lower shadow disatnace to 0.37um - which will indeed enable 2,250 PPI and 11K high-resolution mobile AMOLEDs. Korea equipment maker DAWONSIS developed a new OLED deposition process that is based on FMM but according to the company can be scalable to large-area deposition. This could theoretically enable efficient evaporation-based OLED TV production. The so-called Joule Heating Deposition process use a large area material source (as opposed to point-sources or line-sources currently used) using a conductive film that is efficiency heated using voltage induction. According to DAWONSIS this process is scalable and also efficient in terms of material usage (which is about 70%-80%). One of the key requirements for VR application is high-density displays, as small-sized displays are magnified to cover our whole field of view. Some estimate that realism VR demands around 2,000 PPI. During SID 2016, Samsung announced it developed a 806 PPI AMOLED especially for VR application. This is an upgrade from current OLEDs, but still a far cry from the 2,000 PPI mentioned above.